If you're looking to have your ceremony, reception and wedding photos all together in a French Chateau styled banquet hall then Le Jardin in Brampton is just the ticket. This easy to access venue has ample parking and is easy to get to from Pearson International Airport. The winding staircases and the french decor throughout allows us as wedding photographers to capture all portions of your day with beautiful lighting and class. We can get up on the balcony to take an overall picture of the entire wedding with all the guests and then leaves enough space in the ballroom to host up to 400 of your guests while serving them fine food with great service. A family owned banquet facility that will cater to your wedding. 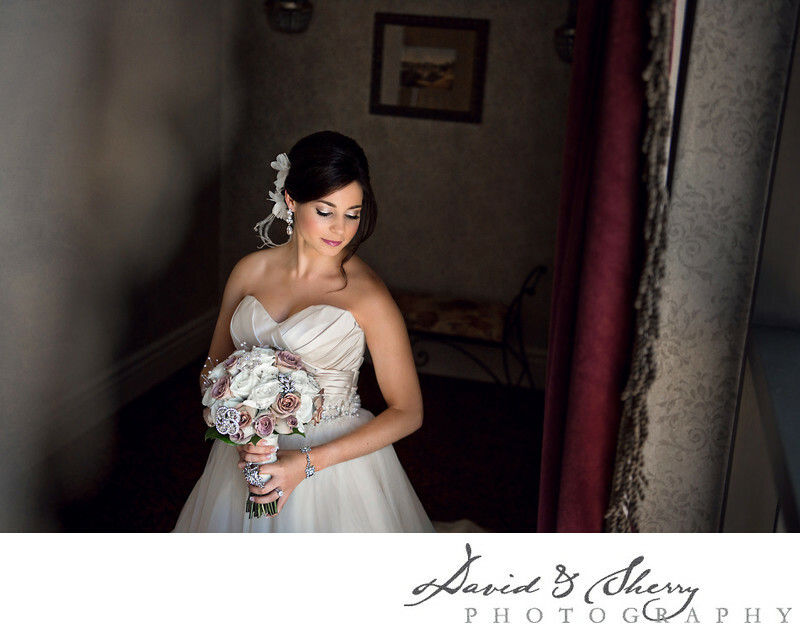 This particular photo is one that we love to take at all weddings, by using natural light pouring in a window we showcase the bride in all her glory with her hair and her makeup done while dressed in her wedding gown and holding her bouquet. I love the look and composition of this photo. Of course it helps that our bride was incredibly gorgeous. Her dress selection also helped show her thin curves nicely and her white, silver and burgundy bouquet was unique and complimentary.